Eureka 3® uses a number of new technology innovations to provide a high performance leak correlator. 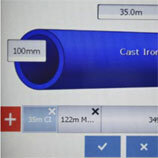 Eureka 3 is intuitive and very easy to use. 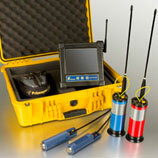 It also has many advanced features to allow operators to obtain optimum leak location results. Eureka 3® is a new innovative design that builds upon the established confidence and performance users gained from the Eureka 2R leak noise correlator. Eureka 3 combines simple operation, via an interactive touch screen display, with optimum performance and sophisticated features. The result is optimum performance and return on investment.